We're behind you with every adventure! 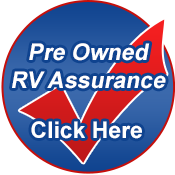 We want you to be 100% satisfied with your new or pre-owned R.V. purchase. Call today for all your parts and service needs! We offer a complete line of towing accessories at very competitive prices. Check with us for all your towing needs. We offer Parts & Accessories for most RV's at very competitve prices. Check with us for all your Parts & Accessories needs. We have factory trained technicians that can repair & service any make of R.V.